Cut paper, cardboard, chipboard, felt, and cloth, but not fingers. 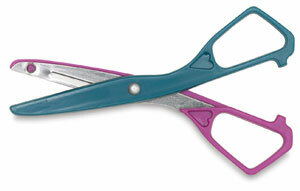 Metal blades with blunt ends are inlaid with plastic assure safe, stay-sharp cutting. For right and left-handed students. 5-1/2" long, 2" cut. ™ Acme is a trademark.